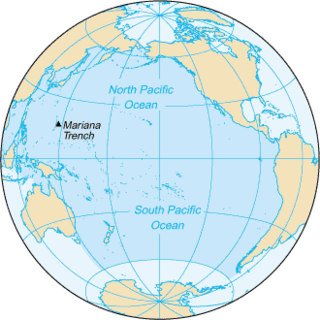 The Marquesas hotspot is a volcanic hotspot in the central Pacific Ocean. It is responsible for the Marquesas Islands, a group of 12 volcanic islands and one of the five archipelagos of French Polynesia. A reef is a bar of rock, sand, coral or similar material, lying beneath the surface of water. Many reefs result from natural, abiotic processes—deposition of sand, wave erosion planing down rock outcrops, etc.—but the best known reefs are the coral reefs of tropical waters developed through biotic processes dominated by corals and coralline algae. The Ocean Drilling Program (ODP) was a multinational effort to explore and study the composition and structure of the Earth's oceanic basins. ODP, which began in 1985, was the successor to the Deep Sea Drilling Project initiated in 1968 by the United States. ODP was an international effort with contributions of Australia, Germany, France, Japan, the United Kingdom and the ESF Consortium for Ocean Drilling (ECOD) including 12 further countries. The program used the drillship JOIDES Resolution on 110 expeditions (legs) to collect about 2000 deep sea cores from major geological features located in the ocean basins of the world. Drilling discoveries led to further questions and hypotheses, as well as to new disciplines in earth sciences such as the field of paleoceanography. In 2004 ODP transformed into the Integrated Ocean Drilling Program (IODP). A mound is a heaped pile of earth, gravel, sand, rocks, or debris. Most commonly, mounds are earthen formations such as hills and mountains, particularly if they appear artificial. A mound may be any rounded area of topographically higher elevation on any surface. Artificial mounds have been created for a variety of reasons throughout history, including ceremonial, burial (tumulus), and commemorative purposes. The Izu–Bonin–Mariana (IBM) arc system is a tectonic-plate convergent boundary. 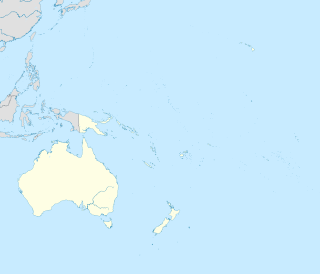 The IBM arc system extends over 2800 km south from Tokyo, Japan, to beyond Guam, and includes the Izu Islands, Bonin Islands, and Mariana Islands; much more of the IBM arc system is submerged below sealevel. The IBM arc system lies along the eastern margin of the Philippine Sea Plate in the Western Pacific Ocean. It is most famous for being the site of the deepest gash in Earth's solid surface, the Challenger Deep in the Mariana Trench. 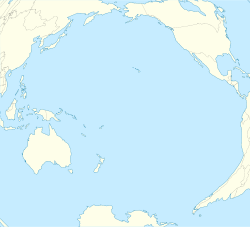 Ioah Guyot is a seamount in the Pacific Ocean, close to the Marshall Islands. Part of the Magellan Seamounts, it is a shield volcano that has erupted alkali basalt and hawaiite 87 million years ago, but may have continued erupting into the Miocene. During the Cretaceous, reefs developed on the guyot. Ujlān volcanic complex is a group of seamounts in the Marshall Islands. The complex consists of the seamounts Ļajutōkwa, Ļalibjet, Likelep, Ļotāb and Ujlān which with a minimum depth of 1,250 metres (4,100 ft) is the shallowest part of the complex; sometimes Ujelang Atoll is also considered to be a part of the complex; Eniwetok atoll and Lo-En seamount form a cluster together with this volcanic complex. 1 2 Arreguín-Rodríguez, Alegret & Thomas 2016, p. 348. ↑ "Allison Guyot". GEOnet Names Server . Retrieved 2019-02-24. ↑ Winterer, Edward L.; Metzler, Christopher V. (10 November 1984). "Origin and subsidence of Guyots in Mid-Pacific Mountains". Journal of Geophysical Research: Solid Earth. 89 (B12): 9973. Bibcode:1984JGR....89.9969W. doi:10.1029/jb089ib12p09969. ISSN 0148-0227. 1 2 3 "Allison Guyot". Seamount Catalog. Retrieved 7 October 2018. ↑ "Search Results". Seamount Catalog. Retrieved 24 February 2019. ↑ "Ocean Drilling Program". Texas A&M University . Retrieved 8 July 2018. ↑ "Ocean Drilling Program Legacy". Consortium for Ocean Leadership. Retrieved 10 January 2019. 1 2 Bralower & Mutterlose 1995, p. 31. 1 2 3 4 5 6 7 8 9 Sager & Tarduno 1995, p. 399. ↑ Winterer, Sager & Firth 1992, pp. 56–57. 1 2 3 Baker, Castillo & Condliffe 1995, p. 255. ↑ Winterer & Sager 1995, p. 497. 1 2 3 Bralower & Mutterlose 1995, p. 32. 1 2 3 4 5 6 "International Chronostratigraphic Chart" (PDF). International Commission on Stratigraphy. August 2018. Retrieved 22 October 2018. 1 2 3 Baker, Castillo & Condliffe 1995, p. 245. ↑ Bralower et al. 1995, p. 843. 1 2 3 4 Winterer & Sager 1995, p. 501. ↑ Bouma, Arnold H. (September 1990). "Naming of undersea features". Geo-Marine Letters. 10 (3): 121. Bibcode:1990GML....10..119B. doi:10.1007/bf02085926. ISSN 0276-0460. 1 2 3 4 5 6 Winterer & Sager 1995, p. 516. ↑ Röhl & Ogg 1996, p. 606. 1 2 Grötsch & Flügel 1992, p. 156. 1 2 Iryu & Yamada 1999, p. 476. 1 2 Winterer & Sager 1995, p. 527. ↑ Winterer, Sager & Firth 1992, p. 10. ↑ Shipboard Scientific Party 1993, p. 15. 1 2 Pringle, M.S. ; Duncan, R.A. (May 1995). "Radiometric Ages of Basaltic Lavas Recovered at Sites 865, 866, and 869" (PDF). Proceedings of the Ocean Drilling Program, 143 Scientific Results. Proceedings of the Ocean Drilling Program. 143. Ocean Drilling Program. p. 282. doi:10.2973/odp.proc.sr.143.218.1995 . Retrieved 2018-10-08. 1 2 Winterer, Jerry. "Relative changes in Cretaceous sea level as recorded on guyots of the Mid-Pacific Mountains" (PDF). ODP Legacy. Retrieved 8 October 2018. ↑ Winterer & Sager 1995, p. 509. 1 2 3 Janney & Castillo 1999, p. 10574. ↑ Winterer & Sager 1995, p. 508. ↑ Smoot, N.Christian (December 1999). "Orthogonal intersections of megatrends in the Western Pacific ocean basin: a case study of the Mid-Pacific mountains". Geomorphology. 30 (4): 344. Bibcode:1999Geomo..30..323S. doi:10.1016/S0169-555X(99)00060-4. ISSN 0169-555X. ↑ Janney & Castillo 1999, p. 10571. 1 2 Grötsch & Flügel 1992, p. 153. 1 2 3 Pringle et al. 1993, p. 359. ↑ Iryu & Yamada 1999, p. 485. ↑ Röhl & Strasser 1995, p. 211. ↑ Röhl & Ogg 1996, pp. 595–596. ↑ Röhl & Ogg 1996, p. 596. ↑ Strasser, A.; Arnaud, H.; Baudin, F.; Rohl, U. (May 1995). "Small-Scale Shallow-Water Carbonate Sequences of Resolution Guyot (Sites 866, 867, and 868)" (PDF). Proceedings of the Ocean Drilling Program, 143 Scientific Results. Proceedings of the Ocean Drilling Program. 143. Ocean Drilling Program. p. 119. doi:10.2973/odp.proc.sr.143.228.1995 . Retrieved 2018-10-08. ↑ Mylroie, John E.; Carew, James L.; Moore, Audra I. (September 1995). "Blue holes: Definition and genesis". Carbonates and Evaporites. 10 (2): 225. doi:10.1007/bf03175407. ISSN 0891-2556. ↑ Pringle et al. 1993, p. 360. ↑ Winterer & Sager 1995, p. 498. ↑ Sleep, N H (May 1992). "Hotspot Volcanism and Mantle Plumes". Annual Review of Earth and Planetary Sciences. 20 (1): 19. Bibcode:1992AREPS..20...19S. doi:10.1146/annurev.ea.20.050192.000315. ↑ Paull et al. 1995, p. 232. ↑ Winterer & Sager 1995, p. 518. 1 2 3 Iryu & Yamada 1999, p. 477. 1 2 3 Baker, Castillo & Condliffe 1995, p. 253. ↑ Jenkyns, H.C.; Strasser, A. (May 1995). "Lower Cretaceous Oolites from the Mid-Pacific Mountains (Resolution Guyot, Site 866)" (PDF). Proceedings of the Ocean Drilling Program, 143 Scientific Results. Proceedings of the Ocean Drilling Program. 143. Ocean Drilling Program. p. 111. doi:10.2973/odp.proc.sr.143.211.1995 . Retrieved 2018-10-08. 1 2 3 Murdmaa & Kurnosov 1995, p. 459. 1 2 3 4 5 Bralower & Mutterlose 1995, p. 33. 1 2 Iryu & Yamada 1999, p. 478. ↑ Grötsch & Flügel 1992, p. 158. 1 2 3 4 Firth, J.V; Yancey, T.; Alvarez-Zarikian, C. (December 2006). "An 110 Ma Crocodilian-Bearing Vertebrate Assemblage Preserved Between Basalt Flows on a mid-Pacific Seamount, ODP Site 865, Allison Guyot". AGU Fall Meeting Abstracts. 2006: V13A–0651. Bibcode:2006AGUFM.V13A0651F. 1 2 3 4 Baker, Castillo & Condliffe 1995, p. 250. 1 2 Winterer & Sager 1995, p. 503. ↑ Kurnosov et al. 1995, p. 476. ↑ Baker, Castillo & Condliffe 1995, p. 251. ↑ Kurnosov et al. 1995, p. 486. ↑ Baker, Castillo & Condliffe 1995, p. 254. ↑ Kurnosov et al. 1995, p. 479. ↑ Kurnosov et al. 1995, p. 487. ↑ Kurnosov et al. 1995, pp. 478–479. ↑ Winterer & Sager 1995, p. 519. ↑ Murdmaa & Kurnosov 1995, p. 462. ↑ Murdmaa & Kurnosov 1995, p. 466. ↑ Murdmaa & Kurnosov 1995, p. 467. ↑ Murdmaa & Kurnosov 1995, p. 461. ↑ "Claystone". Dictionary Geotechnical Engineering/Wörterbuch Geo Technik. Springer Berlin Heidelberg. 2014. p. 232. doi:10.1007/978-3-642-41714-6_32252. ISBN 9783642417139. ↑ Shipboard Scientific Party 1993, p. 16. ↑ Littke, Ralf; Sachsenhofer, Reinhard F. (November 1994). "Organic Petrology of Deep Sea Sediments: A Compilation of Results from the Ocean Drilling Program and the Deep Sea Drilling Project". Energy & Fuels. 8 (6): 1505. doi:10.1021/ef00048a041. ISSN 0887-0624. ↑ Baudin & Sachsenhofer 1996, p. 311. 1 2 Baudin & Sachsenhofer 1996, p. 320. ↑ Baudin et al. 1995, p. 189. ↑ Baudin et al. 1995, p. 176. 1 2 3 4 Winterer & Sager 1995, p. 504. ↑ Sager & Tarduno 1995, p. 402. 1 2 3 4 5 6 7 Winterer & Sager 1995, p. 532. ↑ Röhl & Ogg 1996, p. 608. ↑ Sager & Tarduno 1995, p. 403. ↑ Baudin et al. 1995, p. 191. 1 2 3 Swinburne & Masse 1995, p. 9. ↑ Paull et al. 1995, p. 231. ↑ Winterer & Sager 1995, p. 521. 1 2 Shipboard Scientific Party 1993, p. 17. 1 2 3 Sliter 1995, p. 20. 1 2 Winterer & Sager 1995, p. 525. ↑ Grötsch & Flügel 1992, p. 155. ↑ Grötsch & Flügel 1992, pp. 155–156. ↑ Swinburne & Masse 1995, p. 3. ↑ Paduan, Jennifer B.; Clague, David A.; Davis, Alicé S. (November 2007). "Erratic continental rocks on volcanic seamounts off the US west coast". Marine Geology. 246 (1): 7. Bibcode:2007MGeol.246....1P. doi:10.1016/j.margeo.2007.07.007. ISSN 0025-3227. ↑ Jenkyns & Wilson 1999, p. 342. ↑ Jenkyns & Wilson 1999, p. 372. ↑ Sliter 1995, p. 23. ↑ Winterer & Sager 1995, p. 523. ↑ Winterer & Sager 1995, pp. 532–533. ↑ Winterer & Sager 1995, p. 526. ↑ Jenkyns & Wilson 1999, p. 373. ↑ Jenkyns & Wilson 1999, p. 374. 1 2 Jenkyns & Wilson 1999, p. 375. ↑ Jenkyns & Wilson 1999, p. 378. ↑ Jenkyns & Wilson 1999, p. 355. ↑ Graf, Gerhard (2014). "Bioturbation". Encyclopedia of Marine Geosciences. Springer Netherlands. pp. 1–2. doi:10.1007/978-94-007-6644-0_132-1. ISBN 9789400766440. ↑ Arreguín-Rodríguez, Alegret & Thomas 2016, p. 350. ↑ Bralower et al. 1995, p. 842. ↑ Arreguín-Rodríguez, Alegret & Thomas 2016, p. 346. ↑ Arreguín-Rodríguez, Alegret & Thomas 2016, p. 349. ↑ Arreguín-Rodríguez, Alegret & Thomas 2016, p. 354. ↑ Arreguín-Rodríguez, Alegret & Thomas 2016, p. 359. ↑ Arreguín-Rodríguez, Alegret & Thomas 2016, p. 355. ↑ Bralower & Mutterlose 1995, p. 52. Baker, P.E. ; Castillo, P.R. ; Condliffe, E. (May 1995). "Petrology and Geochemistry of Igneous Rocks from Allison and Resolution Guyots, Sites 865 and 866" (PDF). Proceedings of the Ocean Drilling Program, 143 Scientific Results. Proceedings of the Ocean Drilling Program. 143. Ocean Drilling Program. pp. 245–261. doi:10.2973/odp.proc.sr.143.216.1995 . Retrieved 2018-10-07. Baudin, F.; Deconinck, J.-F.; Sachsenhofer, R.F. ; Strasser, A.; Arnaud, H. (May 1995). "Organic Geochemistry and Clay Mineralogy of Lower Cretaceous Sediments from Allison and Resolution Guyots (Sites 865 and 866), Mid-Pacific Mountains" (PDF). Proceedings of the Ocean Drilling Program, 143 Scientific Results. Proceedings of the Ocean Drilling Program. 143. Ocean Drilling Program. pp. 173–196. doi:10.2973/odp.proc.sr.143.220.1995 . Retrieved 2018-10-08. Bralower, T.J; Mutterlose, J. (May 1995). "Calcareous Nannofossil Biostratigraphy of Site 865, Allison Guyot, Central Pacific Ocean: A Tropical Paleogene Reference Section" (PDF). Proceedings of the Ocean Drilling Program, 143 Scientific Results. Proceedings of the Ocean Drilling Program. 143. Ocean Drilling Program. pp. 31–47. doi:10.2973/odp.proc.sr.143.204.1995 . Retrieved 2018-10-07. Jenkyns, Hugh C.; Wilson, Paul A. (1 May 1999). "Stratigraphy, paleoceanography, and evolution of Cretaceous Pacific guyots; relics from a greenhouse Earth". American Journal of Science. 299 (5): 341–392. Bibcode:1999AmJS..299..341J. CiteSeerX 10.1.1.507.1760 . doi:10.2475/ajs.299.5.341. ISSN 0002-9599. Kurnosov, V.; Zolotarev, B.; Eroshchev-Shak, V.; Artamonov, A.; Kashinzev, Murdmaa (December 1995). "Alteration of Basalts from the West Pacific Guyots, Legs 143 and 144" (PDF). Proceedings of the Ocean Drilling Program, 144 Scientific Results. Proceedings of the Ocean Drilling Program. 144. Ocean Drilling Program. pp. 475–491. doi:10.2973/odp.proc.sr.144.068.1995 . Retrieved 2018-10-07. Murdmaa, I.; Kurnosov, V.and Vasilyeva (December 1995). "Clay Mineralogy of the Shallow-Water Deposits on Allison and Resolution Guyots, Sites 865 and 866" (PDF). Proceedings of the Ocean Drilling Program, 144 Scientific Results. Proceedings of the Ocean Drilling Program. 144. Ocean Drilling Program. pp. 459–468. doi:10.2973/odp.proc.sr.144.069.1995 . Retrieved 2018-10-08. Paull, C.K. ; Fullagar, P.D. ; Bralower, T.J.; Rohl, U. (May 1995). "Seawater Ventilation of Mid-Pacific Guyots Drilled during Leg 143" (PDF). Proceedings of the Ocean Drilling Program, 143 Scientific Results. Proceedings of the Ocean Drilling Program. 143. Ocean Drilling Program. pp. 231–241. doi:10.2973/odp.proc.sr.143.222.1995 . Retrieved 2018-10-07. Röhl, U.; Strasser, A. (May 1995). "Diagenetic Alterations and Geochemical Trends in Early Cretaceous Shallow-Water Limestones of Allison and Resolution Guyots (Sites 865 to 868)" (PDF). Proceedings of the Ocean Drilling Program, 143 Scientific Results. Proceedings of the Ocean Drilling Program. 143. Ocean Drilling Program. pp. 197–229. doi:10.2973/odp.proc.sr.143.224.1995 . Retrieved 2018-10-08. Sager, W.W.; Tarduno, J.A. (May 1995). "Paleolatitude Inferred from Cretaceous Sediments, Hole 865A, Allison Guyot, Mid-Pacific Mountains" (PDF). Proceedings of the Ocean Drilling Program, 143 Scientific Results. Proceedings of the Ocean Drilling Program. 143. Ocean Drilling Program. pp. 399–403. doi:10.2973/odp.proc.sr.143.250.1995 . Retrieved 2018-10-07. Shipboard Scientific Party (April 1993). "Synthesis of Results" (PDF). Proceedings of the Ocean Drilling Program, 143 Initial Reports. Proceedings of the Ocean Drilling Program. 143. Ocean Drilling Program. pp. 13–29. doi:10.2973/odp.proc.ir.143.103.1993 . Retrieved 2018-10-07. Sliter, W.V. (May 1995). "Cretaceous Planktonic Foraminifers from Sites 865, 866, and 869: A Synthesis of Cretaceous Pelagic Sedimentation in the Central Pacific Ocean Basin" (PDF). Proceedings of the Ocean Drilling Program, 143 Scientific Results. Proceedings of the Ocean Drilling Program. 143. Ocean Drilling Program. pp. 15–30. doi:10.2973/odp.proc.sr.143.202.1995 . Retrieved 2018-10-07. Swinburne, N.H.M. ; Masse, J.-P. (May 1995). "Early Cretaceous Rudist Fauna of Allison and Resolution Guyots, Mid-Pacific Mountains" (PDF). Proceedings of the Ocean Drilling Program, 143 Scientific Results. Proceedings of the Ocean Drilling Program. 143. Ocean Drilling Program. pp. 3–14. doi:10.2973/odp.proc.sr.143.207.1995 . Retrieved 2018-10-07. Winterer, Edward L.; Sager, William W.; Firth, John V. (1992). "Ocean Drilling Program; Leg 143 preliminary report, Northwest Pacific atolls and guyots" (PDF). Ocean Drilling Program, Texas A & M University, College Station, TX, United States. College Station, Texas . Retrieved 11 February 2019. Winterer, E.L.; Sager, W.W. (May 1995). "Synthesis of Drilling Results from the Mid-Pacific Mountains: Regional Context and Implications" (PDF). Proceedings of the Ocean Drilling Program, 143 Scientific Results. Proceedings of the Ocean Drilling Program. 143. Ocean Drilling Program. pp. 497–535. doi:10.2973/odp.proc.sr.143.245.1995 . Retrieved 2018-10-07.